TPG’s wealth of knowledge and experience of plated finishes is available to assist Design Engineers specify the correct and appropriate process for their application. We can also process pre-production samples for testing and evaluation, providing test information in house such as XRF thickness measurements, Micro sectioning, Adhesion testing, Solder testing, Porosity testing and even product tests such as Contact resistance testing (Network Analyser 100kHz-20GHz) and Wear testing. With an in-house design team TPG have the ability to create complex masking systems to develop a cost effective production process for your components. Using Solidworks (CAD) we are able to develop masking technology and tooling to simulate the processing of your components before manufacture of the equipment takes place. TPG’s technical specialists are able to offer analysis of base materials and the composition of the plated layers using the latest technology in X ray fluorescence and Micro section. 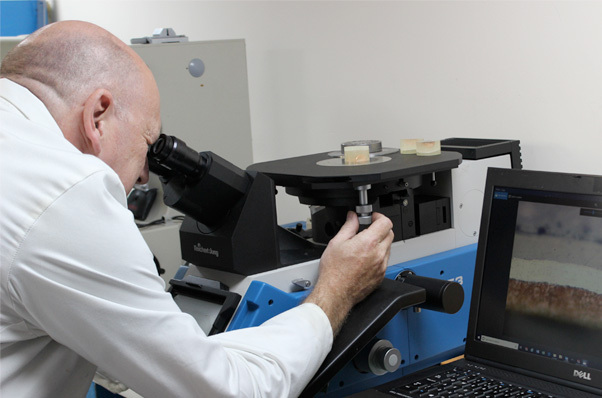 Full detailed reports, including images of optical microscopy, are produced presenting the customer with an independent and detailed analysis of the investigation.